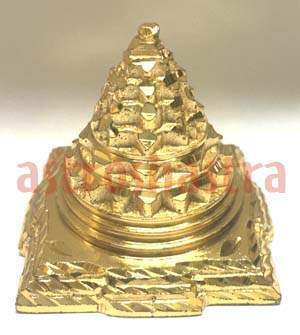 Meru Shree Yantra is one of the oldest, rare and precious Yantra created by 'Aadi Guru Dattatreya' for the welfare common man. Perhaps, the thought of conceiving yantras for the benefit of mankind was formed during the Vedic age when metal came into being. Its design has eight petals as in the case of the original Shree Yantra where the flower Lotus or Kamal has eight groups with sixty four Lotus dal. 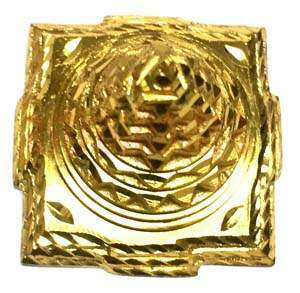 It is also seen that most of the designs of Yantras are based on the growing Lotus flower. Why Guru Dattatreya chose only the Lotus flower as the base ? Lotus is the only holy flower which originate from the navel (Nabhi) of Lord Vishnu. 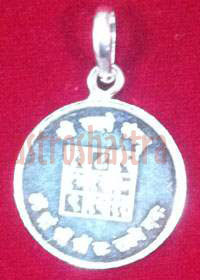 Where the God of knowledge and creator of Veda i.e 'Lord Brahma' is also believed to be seated. Guru Dattatreya is said to be the representative of the United Trinity' i.e. Lord Brahma, Lord Vishnu and Lord Mahesha. Therefore, the force which pushes man to worship the Yantras lies in the strong belief that these are created by this "Trinity themselves who are the creator, preserver and destroyer of the world respectively, who also control the Sun, the Moon, Planets and hence, the whole universe itself. It has Bindu(Point), Trikona (Tringle), Ashtakona, Samghar Chakra (destroying wheel), Sthithi Chakra (Preserving wheel), Chaturdahkona, Ashtdal Kamal (Group of Eight Lotus), Shodash dal Kamal(Group of 16 Lotus), Teen Vrit (Three Crcles), Bhupur (first square), Sampoorna Srishti Chakra (whole system of uiverse and surrounded by Ridhi-Sidhi(prosperity and fame) gates in four directions of Yantra. "Om, Aaing, Hring, Kling, Shring, Mahalakshmye Namah"
It is also believed that the it was vividly used by the learned Brahmin community of coastal area in Rameshwaram, Kerala in Seventh or Eighth Century. The Yantra designed on the mount looks similar to the dome of any temple which is slightly mounted. 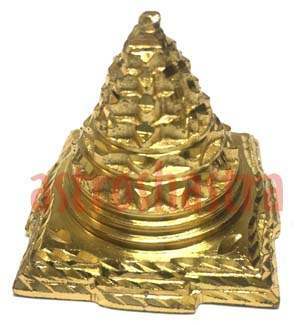 It also depicts one of the fundamental of "Vastu Kala" which says that any residential house, palace or temple must be mounted at the centre to the top, so that the person residing in it should get more and more energy radiation & solar reflections from the cosmic universe or Brahmanda to be more healthy, wealthy and wise. It is Mounted in PANCH-DHATU and is available in three different sizes as Small, Medium and Large. It can be placed either at the foundation of a house, temple or at the strong room, locker and cash box etc. 3. Goddess Lakshmi permanetly resides in it.